When the party's over what better way to say thank you than with this Luminous Pink Paper Gift Bag? Fill this bag to the brim with favours to show your #TeamHen how much you appreciate them! It's perfect for hen parties, wedding gifts and birthdays. 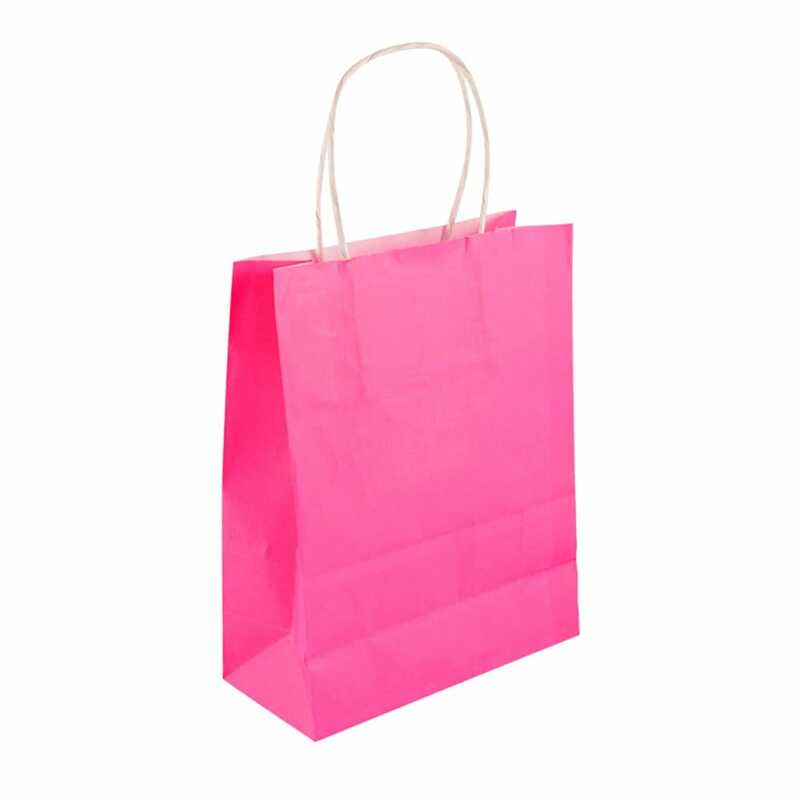 This paper gift bag is a vibrant pink colour and has straw handles. Not sure what to fill it with? Check out our selection of gifts for brides and hens, such as these Mini Lip Gloss Pots or these Bride and Groom Ducks. Showing our 14 Hen Party Luminous Pink Paper Gift Bag reviews with an average rating of Excellent. Would you like to write a review? Great value for money, ordered 50, quick delivery. Not made them up yet but will be great for the night. Thanks. We purchased 25 of these as favour bags and I was a bit wary that for the price the bags would be too flimsy, they were fantastic! Out of 25 we only had one that lost its handle as we were filling the bags but a quick pritt stick down and it was fine. Great value for money compared to other online shops and sturdy enough to take favours which included mirrors and hairbrushes. We created our own printed card labels and stuck them on, so easy to make them personalised for a fraction of the price which in our case saved us a fortune! Colour is a paler pink than the pictures but worked for what we wanted. Great purchase. Great product great value for money , speedy delivery service! Party bags arrived quickly and were the best value bags I could find on the net. I loved these! I planned a girls night out and at the last minute thought of doing surprise gift bags for everyone. Did a google search and found these - PERFECT! I would definitely order again. Arrived very quickly. Really lovely little bags, nice bright colour and a lot sturdier than I thought they would be. Good value for money. I ordered 17 and unfortunately one came with only one handle so make sure you order a spare! I bought these bags for my daughters 10th birthday party for her girly friends. They were the perfect size and colour for what I needed and was a great price with fast delivery. These are much smaller than I thought they would Be, not really big enough for the things I'm putting in........wine glasses!! But that said they are nice, colour is as shown and sturdy. Just what I needed. Speedy delivery, perfect service over the phone when I had a query too. Thanks Guys.